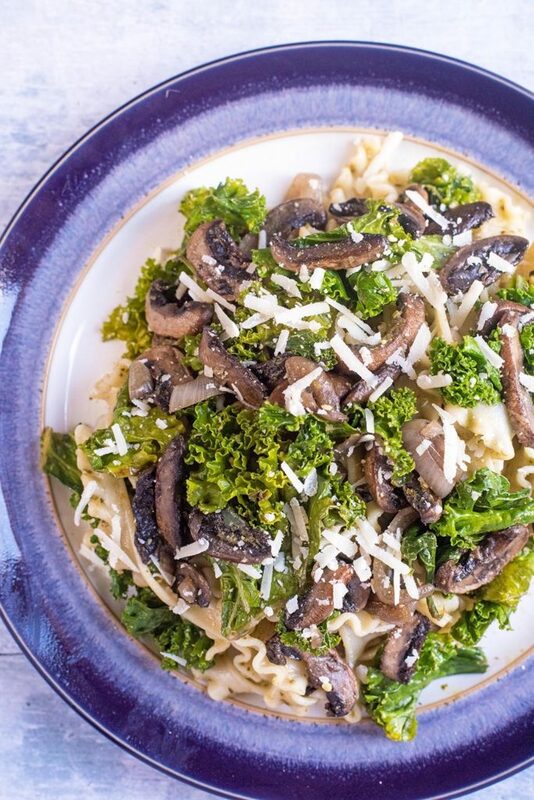 If you aren’t usually a fan of kale, then this is a recipe for you to try. 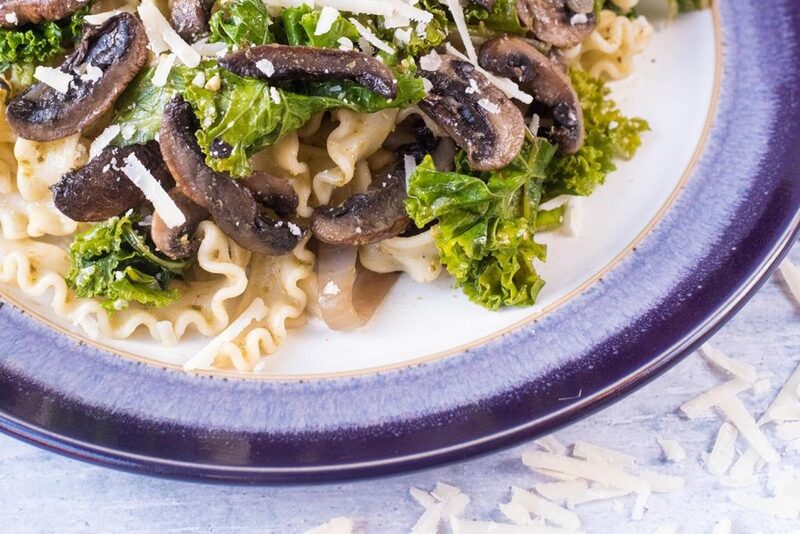 The kale gets nice and crispy and stirred into pasta with herby pesto and chunks of mushrooms this Mushroom and Kale Pesto Pasta is healthy comfort food at its finest. Join me in celebrating the start of kale season, with a hearty dish that the whole family will enjoy and it’s ready in under 15 minutes. I have said it before, but Dave isn’t the biggest fan of kale, but still I keep trying to find more ways for him to enjoy it. Why? because I LOVE kale and it’s nice to share your the things you love, right? But in all seriousness, kale has so many healthy benefits and it’s all about finding the right way to cook it. Dave loves kale crisps, so as long as it’s nice and crispy he will eat it. 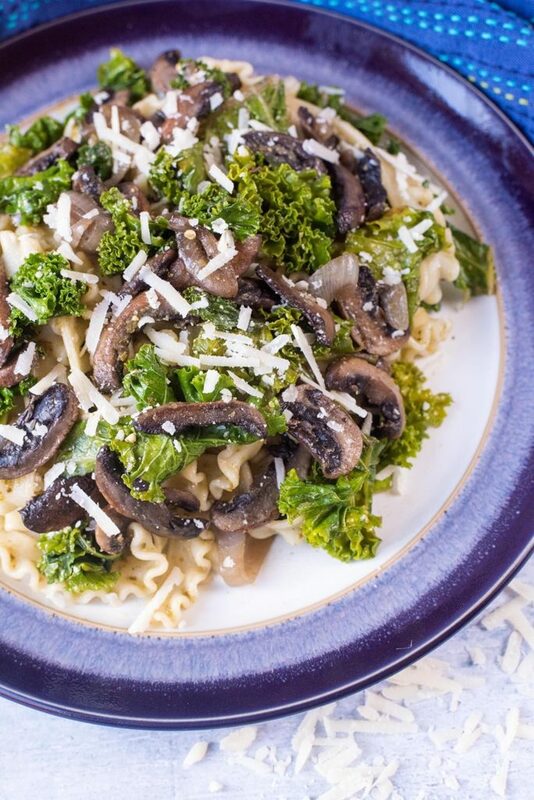 Do you want to be kept up to date on more delicious recipes like this Mushroom and Kale Pesto Pasta? Please subscribe to the blog mailing list (it takes 30 seconds). You will get sent the new recipes straight to your inbox. Your email address won’t be passed on to anyone and you will never be spammed. We made our own pesto the other day, and it’s not just any pesto, but pistachio pesto! It is pretty life changing to be honest, and the recipe for that will be coming soon. You can use any pesto in this recipe, but homemade is the way to go because you can make just as much as you need. Does anyone else find that jars of pesto go off really quickly? The label says consume within 3 days, but thats a lot of pesto in a short space of time and we hate waste. Waste does not make us happy. You know what makes me happy? Eating a really hearty and comforting pasta dish, and knowing that it is bursting with vegetables – it’s the best of both worlds. 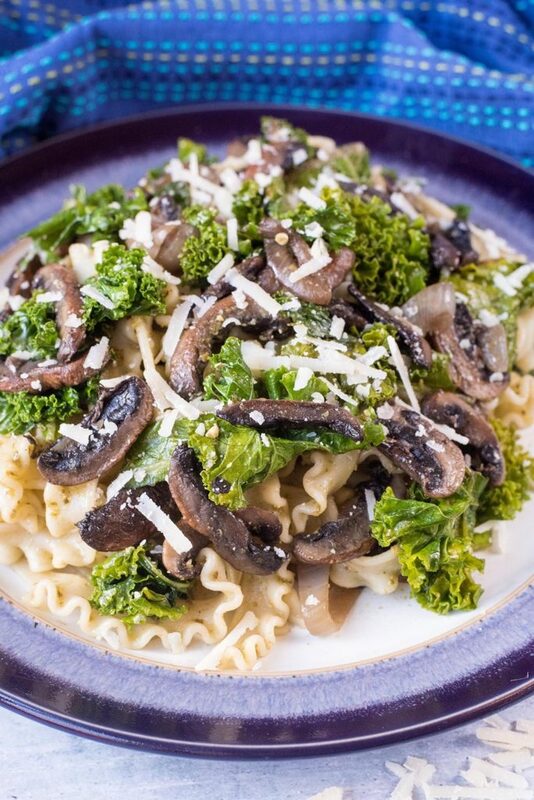 So, when I was challenged for the #FeedYourHappy campaign to come up with a dish that made us happy, I just knew it had to involve pasta and it had to be full of vegetables. If ever I need a little pick me up at dinner time, then pasta is on the menu. I think it must have healing powers or something. It is Organic September and it is also Kale season – YAY! 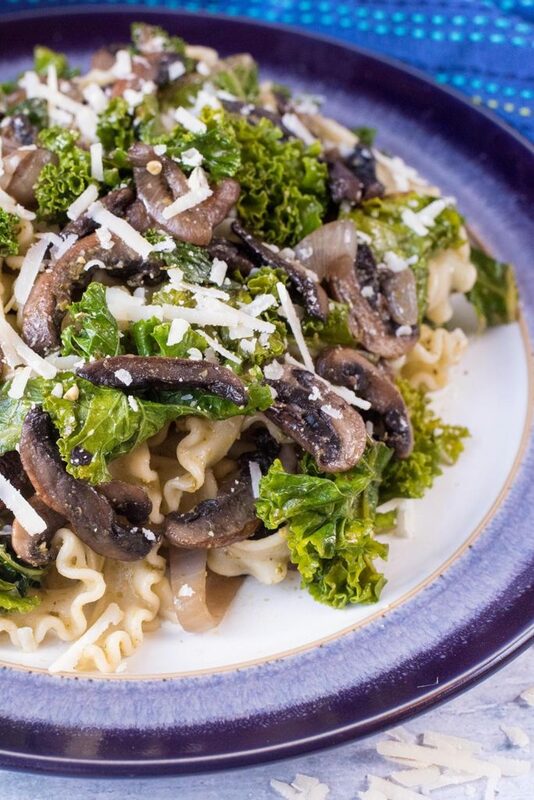 It is no secret that I am a big fan of kale and the many ways that it can be used, so when a big bunch of leafy kale arrived in our Riverford Organic Vegetable Box, it was a given that it was going straight in the pasta dish. When added to the pan, it gets nice and crispy and crispy kale is the best way to enjoy kale in my opinion. We are big in to organic produce at the moment, and trying to make swaps to organic where we can, which is one of the reasons why we love getting our Riverford box delivered – delicious organic produce delivered straight to your door. The excitement of not knowing what you are going to get each week is what I love too and the boxes come with a couple of recipe cards so you can make tasty organic meals at home to #FeedYourHappy. 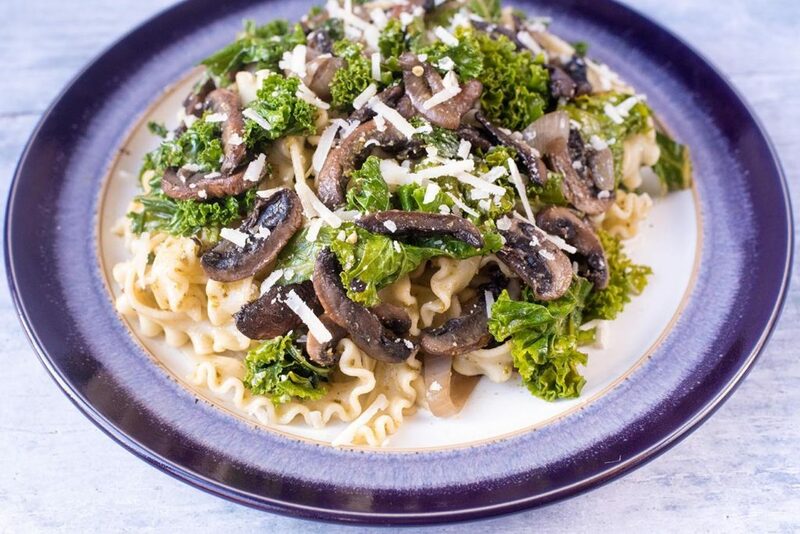 We have teamed up with the Organic Trade Board for their #FeedYourHappy campaign to share our favourite food that makes us happy, using organic ingredients, and that is vegetable packed pasta! With organic food, you know exactly what you are getting and the food is straight from the ground on to your plate with no messing about. Just the way we like it! It’s not just use that likes food that way – Feed Your Happy ambassador Sara Cox explains why she loves organic food too. A delicious organic meal is something else that makes us happy when it comes to food. When you buy organic, you know that fewer pesticides have been used in the farming process. Also, it’s free range, there is no routine use of antibiotics, no GM ingredients and no artificial colours or preservatives. We try to make sure that Avery is only eating organic fruit and vegetables (and she literally devoured everything in our Riverford fruit and vegetable box), because we want to give her the best start in life when it comes to food. You could easily make this dish vegan by using a vegan pesto and in fact I will do that next time, as that would make me even happier. I love finding new filling vegan meals to enjoy, proving that vegan food doesn’t have to be boring and it can be filling too. We are making a conscious effort to eat more vegan meals, so you will see a lot more of those on the blog too. 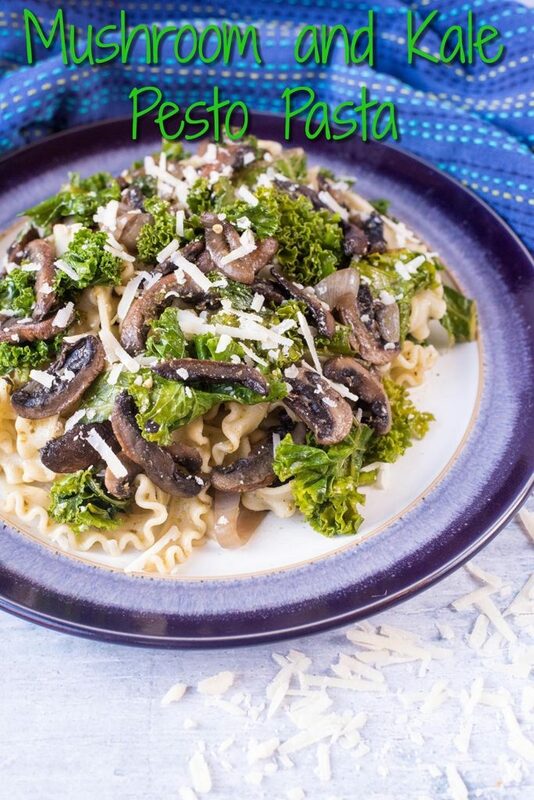 Pesto pasta is my favourite dish and this looks like a good way to jazz it up! This sounds really good! I’m a sucker for any kind of pasta! I am not a huge fan of Kale either, but I’m hoping this one could turn me around! Mmm. I love kale too, but thankfully my hubby likes it too. 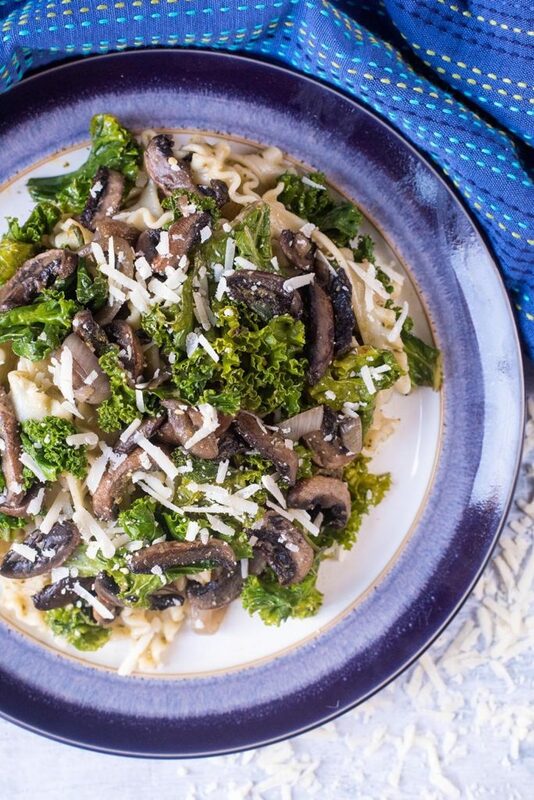 Your mushroom and kale pesto pasta looks so incredibly delicious. I can’t wait to try it. Can’t believe my luck, I have everything in the kitchen already to make this yummy meal! I love kale AND pesto. And mushrooms. So to me this looks amazing! 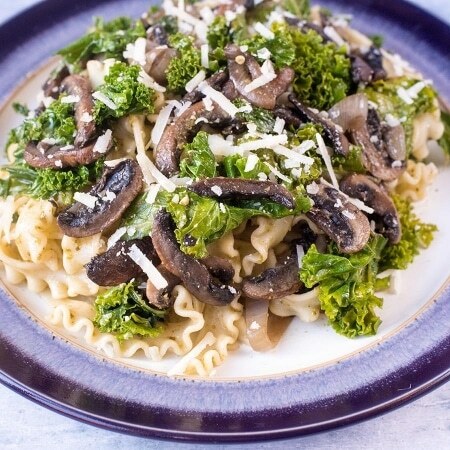 If it was me i think I’d take out the mushrooms but I would love to try the pesto pasta with kale!